In my work as a cross-cultural communicator and business facilitator, I do a lot of translation and interpretation, most of it being technical or business related. So when Ken Chiyoda asked me to translate his article about the “Movable Dream Space” in Hyuga City, Miyazaki, Prefecture, I was intrigued to find out what it was all about and excited to have the opportunity to translate something in a different genre. When I got started, I didn’t realize how the content of the article and Ken’s passion about the project would affect me. Many aspects of his article resonated with me on a personal level and I was truly moved by the level of commitment and dedication from everyone involved in the project. It is very easy to say that you want to revitalize your town or city but making the correct decisions and taking the right steps to increase everyone’s involvement and investment in the city is very difficult. Having a background in education I was impressed by the scale and the high level of execution of this real world project with a positive affect on the community in the context of an elementary school class. The joy of creation, the value of working together for a common goal and the pleasure of being able to give something to the community, are all things that can only be learned by experience. The fact that the students were tasked to create something for the community while taking into consideration the needs of the community and working with adult professionals made the experience more powerful for everyone involved. When translating, I worked hard to try to convey not only the meaning but also the spirit of Ken’s article, especially his feeling of joy and appreciation for being a part of this project. When I delivered the translation, I told Ken that his article moved me and that I felt that he was lucky to be involved with this project and if there was anything I could do to help, to please let me know. After he read my English translation, he said that it took him back to that time and he was moved as well. For me, this was a wonderful reward for my work. We visited Hyuga for 3 days and I got to see the incredible Hyuga Station, which really is a special place. The extensive use of cedar really gives it a refined and warm feeling. I spent a lot of my time at the station just looking up at the cedar ceilings and suspension beams from various angles. Definitely worth a visit if you find yourself in the area. 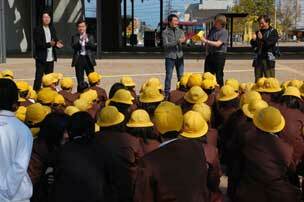 While I was there, I got to meet many of the people involved in the Hyuga City revitalization projects. We shared food and drink and stories and hours of discussion about what had been done so far in Hyuga and the miracle that it was and what to do next. What I sensed from meeting everyone was that a special synergy had developed among the widely varied individuals involved in the project. In many ways, indefinable, but a key element to the success of the project. People also seemed to be truly dedicated and focused on thinking things through and making the right decisions for Hyuga’s future. It was wonderful to be surrounded by and to interact with a group of people who felt honored to be doing their part, no matter how small or large, in the ongoing improvement of Hyuga. Taking part in the execution of a shared vision that they developed together. My hosts treated me to the many delicacies of Miyazaki, Chicken Nanban (fried chicken smothered in Tartar sauce), Chirimen Jyako (boiled and dried young sardines), Jidori Chicken, Yakishio (roasted sea salt) and of course many kinds of Miyazaki shochu. I bought 3 bags of Chirimen Jyako at the place in Mimitsu Port where they make it. Delicious! Mimitsu is a beautiful old town in Hyuga that used to be a hub for Cedar and other materials coming down the river. Many of the houses in the town have been preserved as Cultural Properties so it’s like taking a step back in time. We enjoyed a quiet cup of green tea in the garden of a preserved house that is open for visitors. 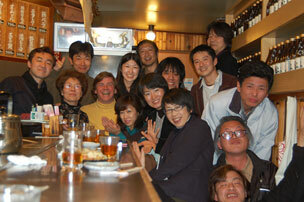 The woman who served us tea was, like many of the people I met in Hyuga, friendly, warm and natural. The main event at the West Exit Square Opening Ceremony was the burying of a time capsule in the middle of the square. People had mailed in letters to be put in the time capsule, which will be opened in 15 years from now. I wonder what Hyuga will look like at that time. At the event, one of the Moveable Dream Spaces was being put to use. It was great to see the actual Yatai in “action”. The design is quite impressive and they really do create a “space” wherever they are set up. 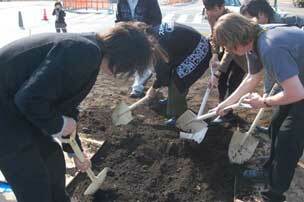 The day after the ceremony, the 6th grade students of Tomitaka elementary school who were participating in the latest extracurricular class came to the square to bury their own version of the time capsule. The theme for this course was clams (a local industry), so the students painted and wrote messages on clamshells to be buried in the square for 8 years. Their shells were displayed during the opening ceremony event. What struck me was the wide range of colors, designs and words that students used to express their own individual wishes, hopes and dreams. 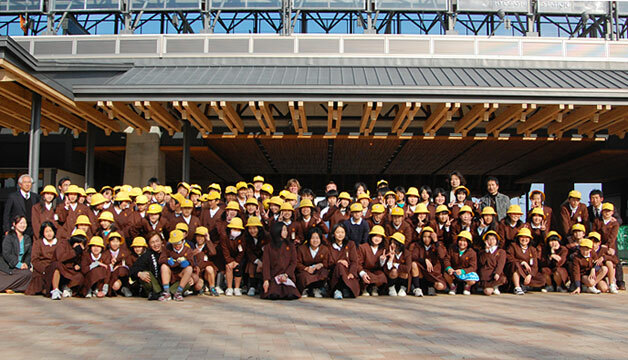 When the time capsule is opened in 8 years, the students will be 20 years old but wherever they may be at that time, a piece of them will be in Hyuga. I am looking forward to going back in 8 years to help dig up the time capsule. So what did I bring back with me from Hyuga? Three bags of Chirimen Jyako, a few bags of Jidori Chicken, a jar of Yakishio (that makes everything I cook taste sweet and full of flavor), some new friends, closer connections to old friends, a keener sense of the passage of time, warmth and hospitality, a rounded cedar object that is wonderfully smooth, fits in your hand, makes you feel calm when you holding it and fills the room it’s in with a hint of cedar, a feeling of community and shared purpose, inspiration to live a life of creation and a real sense of hope that we as human beings, have the ability to surpass our many limitations and incompatibilities and can work together to realize shared dreams that we could not realize on our own.